Use the literacy worksheets below with the ‘Roy’ guided reading story. There are lots of other worksheets for the reading games, these can be found with the lesson plans. These printable literacy worksheets focus on capital letters, full stops, words that rhyme, sentences that make sense, plus much more. Please browse through the worksheets and register if you intend on using any. There are more than 700 printables at Club Roy. Help Roy put the missing words into the sentences. Roy's got his words all muddled up! Can you help him sort the words so his sentences make sense? Oops! More muddled words that don't make any sense. Can you help Roy sort the words so his sentences make sense? Roy wants to collect some full stops. Read the story, underline the full stop and put it into Roy's bucket. There has been a big tidy up at the zoo. The zoo keepers have taken away all Roy's full stops. Can you help put them back in the right places? Read the sentences about Roy. Write them underneath. Start each one with a capital letter. Look at the words in the tractor. Can you see their first letters? Copy them into the correct wheel. Oh dear! Someone has muddled up Roy's story. Can you cut the pictures out and put them back in order. Look at each picture. What's happening? Write a caption for each of the pictures. Oh dear! George has forgotten all about capital letters and full stops. Can you re-write each sentence and put them in for him? Read the poem about Roy. Fill in the missing words. Make sure they rhyme. Read the rhymes and add the missing words. Make sure the sentence rhymes. Use the words in the box to fill in the gaps. Make sure the sentence makes sense. The answers to these questions are all muddled up in the box. Can you write the correct answer to each question on the line? Can you list some good ideas to help Roy find his herd? Can you read the words on the bus? Write each one in the correct suitcase. Sentences - More Missing Words! Can you choose a word from the box to put in the space in each sentence? Think about the story you have just read. Answer these questions. Roy has remembered his full stops but has forgotten about capital letters! Can you put them in for him by rewriting each sentence on the line below. Roy is hungry. Make words by collecting fruit for him. Write the words on the lines. Can you add some direct speech to these speech bubbles to show what Roy and Lucy are saying? Sentences - Does it Make Sense? Some of these sentences don't make sense. In the circles, draw a smiley face for a correct sentence and a sad face for a wrong sentence. Some naughty wildebeests have taken some of the words and hidden them in a bush. Can you find them and put them back in the right place? Questions and Answers - What Happens? Look at the picture and read the question. Write an answer to the question. Can you see the words on the zebras? Use the words to make sentences. Make as many sentences as you can. You can use each word more than once. Write your sentences on the lines. Can you read these signs? Draw a picture for each one. Answer these questions about the story. 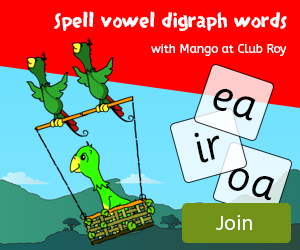 We have more than 700 high-quality worksheets at Club Roy. Each worksheet has been carefully indexed so that you can find it easily. Created to support the reading games and to extend lessons easily.